MONTEVIDEO, URAGUAY—On March 18, the legendary hard rock band Guns N’ Roses brought their Chinese Democracy tour to the Centenario Stadium. Performing to an enthusiastic crowd estimated at more than 30,000 people, the outdoor concert employed a sophisticated sound reinforcement setup that consisted of a large quantity of Aero Series 2 and Aero loudspeaker models from the catalog of D.A.S. Audio. 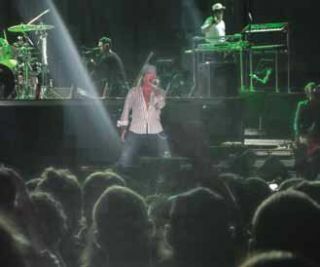 The legendary hard rock band Guns N’ Roses brought their Chinese Democracy tour to the Centenario Stadium using D.A.S. line arrays. Three sound service companies united for this massive undertaking: Leggio Sonido (directed by Jorge Leggio), Ariel Marti’s Marti Audio, and Victor Lampariello’s Compañía Uruguaya de Sonido. Together, these three firms pooled a massive amount of equipment together and pulled off one of the most memorable hard rock concerts to hit Montevideo in quite some time. The main PA system actually consisted of two distinct loudspeaker setups — one for the instruments and a second system dedicated solely to lead vocalist Axel Rose’s voice. The “instrument” system was built using 32 D.A.S. Audio Aero 50 large format, 3-way line array modules — flown 16 elements per side at a height of 12 meters. These loudspeakers were driven by Lab Gruppen FP 10,000Q power amps, with loudspeaker management tasks handled by a Lake processor. The “vocal” system used another 16 Aero 50s — flown eight per side at a height of 10 meters. These were accompanied by an additional eight Aero 12A powered, 2-way loudspeaker systems that were positioned over the center of the stage and flown at a height of 12 meters. For those in search of low end “oomph,” the Guns N’ Roses concert was the place to be. A whopping 64 D.A.S. Audio LX-218 high performance subwoofers — each incorporating dual D.A.S. 18LXN long excursion, neodymium transducers in a front loaded, bass reflex configuration — provided low end support. These sub bass enclosures were deployed 32 units per side.